Armament deformed by gear rotation! New feeling build custom parts appeared! 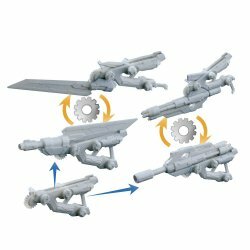 * Two types of large weapons by attaching weapons parts to the base parts with gears installed! * Custom armed with a new feeling that the armed deformed further by the rotation by the gear and becomes four kinds of armed. * Sword parts etc can be equipped even with a single item.